For weeks, cutters in Fort Worth, Texas, have been anticipating this night. 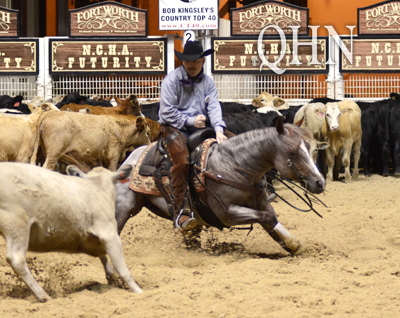 The National Cutting Horse Association (NCHA) Futurity has been building to its Dec. 12 pinnacle – the Futurity Open finals. With an already well-established fan base, Stevie Rey Von commanded attention and won the Open title. Stevie Rey Von (Metallic Cat x Miss Ella Rey x Dual Rey) carried Equi-Stat Elite $1 Million Rider Ed Dufurrena, of Gainesville, Texas, to the Futurity Open Championship when he marked a 225 from the fifth draw in the first of two sets in the 24-horse finals. Along with bragging rights, the stallion, bred by Dufurrena’s son, Brandon Dufurrena, garnered a $200,000 paycheck. While the NCHA Futurity is the first event at which Stevie Rey Von has performed, this was not his first win. Earlier in the week, Dufurrena’s daughter, Rieta Dufurrena, piloted the 3-year-old stallion to a 220 and the Futurity Limited Non-Pro Championship, worth a $9,145 payday. The duo also finished 1.5 points short of a Non-Pro finals berth.